Fuze Website and www.fuze.co.uk/reviews. The reviews back up my earlier thoughts eg. This Year- KS3: We have held off from introducing Computing at KS4 until next year. This means that we can introduce our new Computing Units in years 7, 8 and 9. More importantly, it has given us a year to cram new computing units in the year 9, to give our students practical experience on which to base their decisions for options for next year. (It has also given us some useful data to make decisions about students doing ICT or computing – we would suggest that ICT is a better option for some weaker students). We are introducing or upgrading 11 of our 14 units with our new LLS Computing scheme of learning; mainly with PGOnline materials and our student assessment sheets – now with practical and theory versions – and subsequently tweaking with Mr Colley’s dept framework and resources. PGonline include two units for Small Basic. We are using BBC BASIC and have currently based our first unit on resources from Chris Charles from Fulford school in York. Chris has run several sessions through CAS and has kindly shared his resources. You can get a free evaluation copy of BBC BASIC – see How to install and run BBC BASIC (tutorial written by one of my digital leaders, Oliver). KS2: We are close contact with our main feeder primary school and our KS3 units fit well with what they are currently doing (Kodu and Scratch feature prominently). It is very mixed with our other primaries. Thinking about KS5: Crucially, do you remember that bit in the Computing programme of study where it says at KS4 “All pupils must have the opportunity to study aspects of information technology and computer science at sufficient depth to allow them to progress to higher levels of study or to a professional career”. Seems to me that we will be expected in the future to run both ICT and computing A-level courses in the future (How’s that with a 10% reduction in real-time is the funding schools next year…). Beyond KS5: I have several friends who lecture in Computer Science. One of them has supplied me a summary of the basics needed for when people start programming, and these are totally independent of programming language. When I heard about the new computing curriculum, I asked two of my friends who are computer programmers and discovered that they program wholly in VB.net. I run a regular trip to Teeside University taking both our year 11s and our year 12s, and we quizzed one of the lecturers. Barry Hebbron (‎Senior Lecturer at University of Teesside) who said that they don’t care which language students learn, only that they come to university with a buzz for programming. He describes learning Python as “eating Ryvita”, whereas learning VB.net as “eating Ryvita with sugar on” (still sounds a bit dry…). “Competent and confident teachers and students focussed on purposeful learning using Edtech when needed that is simple to use and works between home and at school”. Whatever we decide has to be best for our students now, in the near future, and help them with jobs. For the Department, it needs to be interesting; enjoyable, achievable, affordable, realistic and sustainable. We need review points to ask students what they think as we develop things. 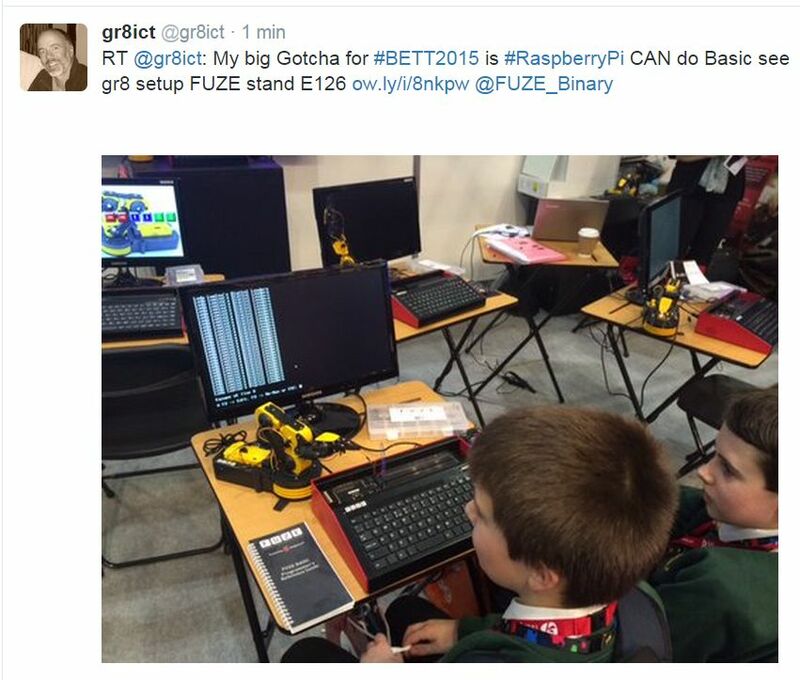 KS3: As above with the introduction of Fuzes and Fuze_Basic (Raspberry Pi’s). – classroom management details here. 1. I’m looking for engagement by as many students as possible. BASIC is easier to get into and understand… if and when they need to learn about an object orientated language like Python they can do it later. 2. I’m looking for interoperability – see my aims above – A class set of Fuzes, with some available all the time at lunchtimes / Students encouraged to have Raspberry Pi’s at home – school provides Fuze_Basic SD cards (enthusiasts at KS3 / KS4 computing students) / all students to have access to free Windows Fuze_BASIC for KS3 work. 3. I want some practical hands-on experience for my students. Without Fuzes, computing will be staring at a computer screen, and I want students to realise that outputs can be lots of different things. See 2014 Christmas Lectures and exploding balloons to see a good example. 4. With one lesson a fortnight (albeit 100 minutes) whatever curriculum we have is not going to change the world. I will be looking for doing the introduction to BASIC in Year 8 culminating in a differentiated numbers game with procedures. I hope to get a class set of Fuzes to do this with next year. In Year 9 I plan to use Flowol and mimics to match differentiated scenarios (with real videos) of simple traffic lights leading up to a well-known three-way junction in Pickering. This will be followed by writing the required algorithms in Fuze_Basic and then using the integrated breadboard to program red yellow and green LEDs to most closely follow the real-life videos. If some reason I don’t get the full set of Fuzes, then we can program flashing sections of the screen instead. 1. This is partly for students but also for teachers as well. The kicker is the requirement to teach ICT and Computing at A-level. I need to be competent with higher-order database and Excel functionality for ICT, AND I need to provide Key Stage 4 and 5 computing in the future too. Pragmatically, if students find VB.net easier and can still get high grades, then I should be doing the best for them. 3. I’m not harming their future progress at University – CS colleagues would prefer that students are enthusiastic and competent (ie. not taught by underconfident/poorly trained teachers trying to do Object Orientated Languages OOL). VB.net can be used as an OOL. If you follow #dlchat (every Thursday 9-9.30) and see my Roadmap you will know that Digital Leaders are great facilitators for the new computing curriculum. The development of level 3 badges in the future requires an outside brief for DLs. >I can see the digital leaders helping me to develop a future unit in BASIC using LED outputs for key stage 3 and more importantly, having one in each year as a go-to for GCSE computing. (we have been given 5 RPi’s from PCJS and these are now out with the DLs – although 4 already had their own – they now have SD cards including Fuze_Basic and copies of the workbook).